The 19th March marks the 13th anniversary of my old comrade Charlie Ronayne (Midleton Co. Cork), who died in 2004. Left to Right: Jim Lane. 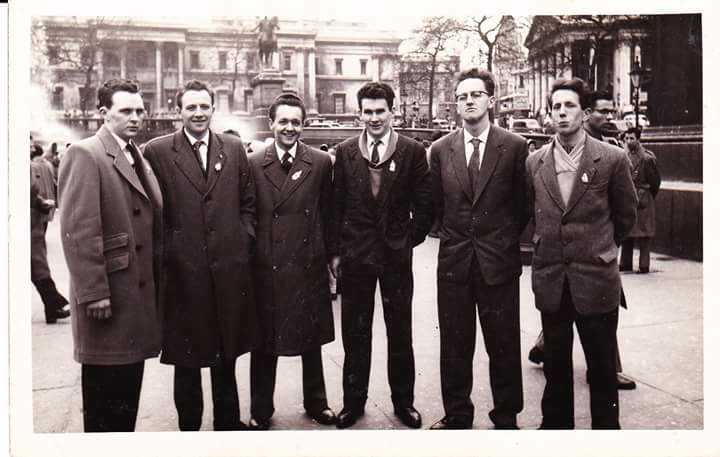 Charlie Roayne – O’Mahony, Seán Murry, ‘Gypo’ O’Mahony and Jerry Madden. Charlie and I first met as we went together with others, across the Border on 11th December 1956 to fight the forces of occupation in the Six North Eastern Counties of Ireland. 18 Cork IRA Volunteers went on active service the following night, 12th December 1956. The attached photo was taken at Easter 1960 in Trafalgar Square, London. All 6 in the photo were Irish Republicans. In 1962, Charlie was best-man at my wedding. In later years, Charlie was a Town Councillor representing Sinn Fein on Midleton Town Council. He was re-elected several times. We remained the best of comrades all through the remainder of his life. Ní beidh a leitéid ann arís. With many thanks to: Jim Lane, Ann Connolly. Author seachranaidhe1Posted on March 20, 2017 Categories IRISH REPUBLICAN HISTORYTags 'Gypo', 11th December 1956, 12th December 1956, 13th anniversary, 18 Cork IRA Volunteers, 1962, 19th March, 2004, across the Border, active service, Ann Connolly, best-man, Charlie, Charlie Ronayne, Co Cork, comrades, died, Easter 1960, forces of occupation, Ireland, irish republicans, Jerry Madden, Jim Lane, London, Midleton, Midleton Town Council, Ní beidh a leitêid ann arís, O'Mahony, re-elected, remainder of his life, Seán Murry, Sinn Féin, Six North Eastern Counties, Town Councillor, Trafalgar Square, weddingLeave a comment on The 19th March marks the 13th anniversary of my old comrade Charlie Ronayne (Midleton Co. Cork), who died in 2004.